Energy is the fundamental currency of the physical world, while GDP is the imperfect catch-all measure of economic progress. The plot shows electricity generation per capita against GDP per capita for 2015. The bubble areas represent population size, while the colours are the fraction of power which is produced from renewable sources – with light green a high percentage and dark green a low percentage. All data refer to 2015, except the colours which are for 2013. Brazil has been in the limelight during the 2016 Olympics. It is also lime green on the plot because it produced an impressive 76% of its energy from renewable resources in 2013. 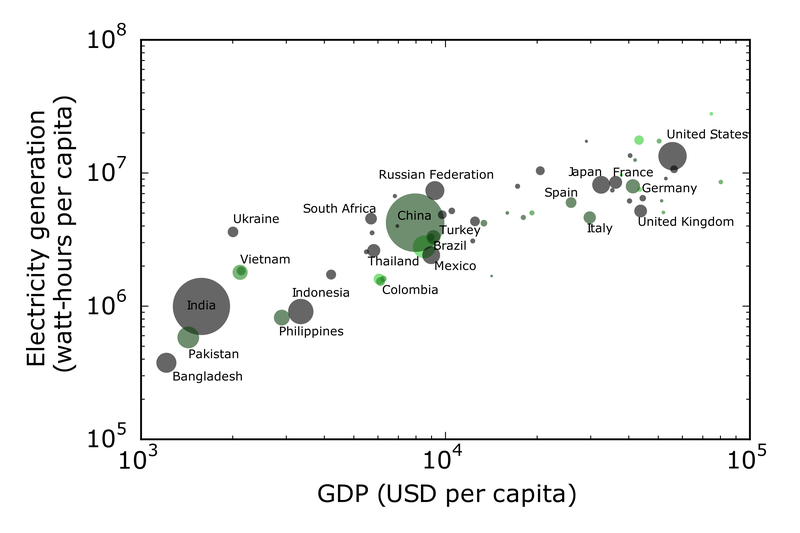 Across countries, electricity and GDP are very strongly correlated. But which way does the causality go? Studies have found evidence for GDP causing electricity generation, electricity generation causing GDP and for a bi-directional relationship. For the UK, the evidence suggests that it is a bi-directional dependence, based on a bootstrapped Granger causality test. Given over 85% of the world’s primary energy consumption comes from fossil fuels, countries around the world are either going to have to find new ways to produce power or break the link between GDP and electricity – whichever direction the causality runs. Arthur Turrell works in the Bank’s Advanced Analytics Division.